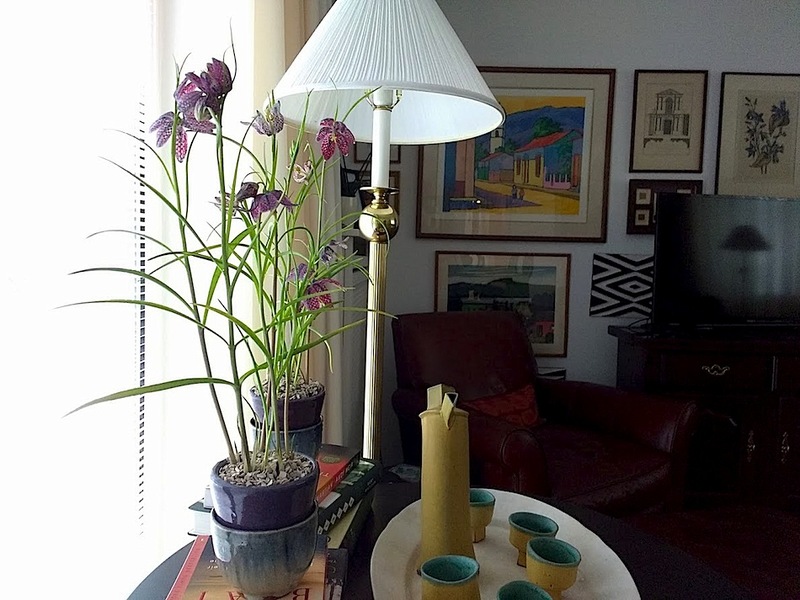 Potted Fritillaria meleagris in our living room this week. 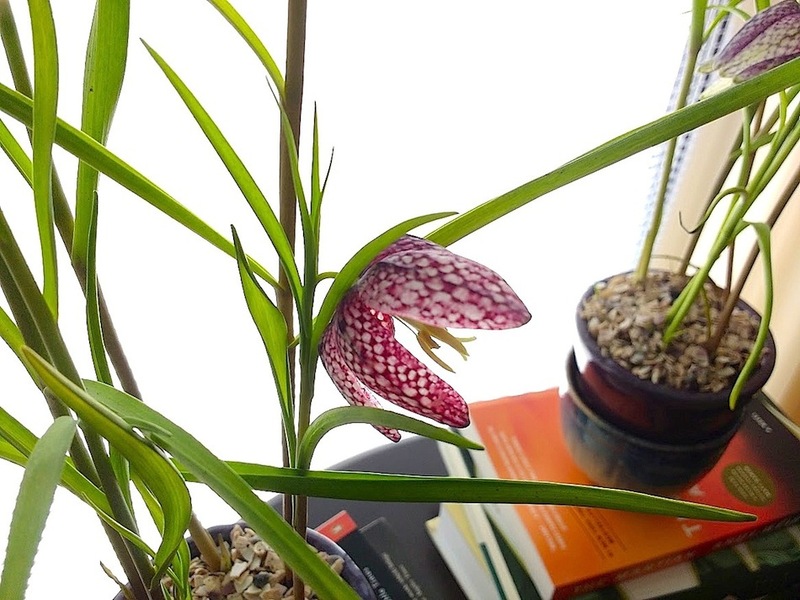 The plants are 13″ to 15″ tall. 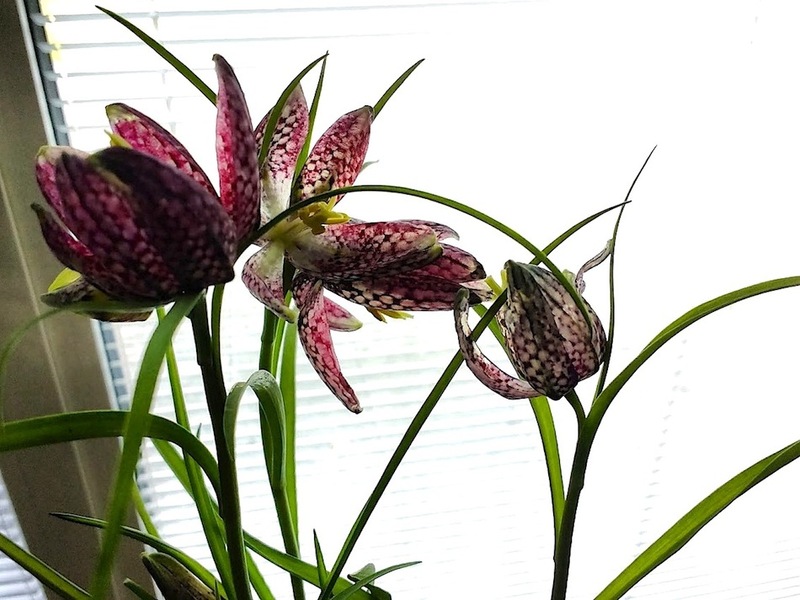 I love the checkered pattern on the blooms. Right now, almost all the supermarkets and florists here are selling small plastic pots of three or four blooming or almost-blooming spring bulbs (about €3.30 each — cheaper than a lot of cut flowers). I replanted these into two purple ceramic pots that I had from a previous plant purchase. 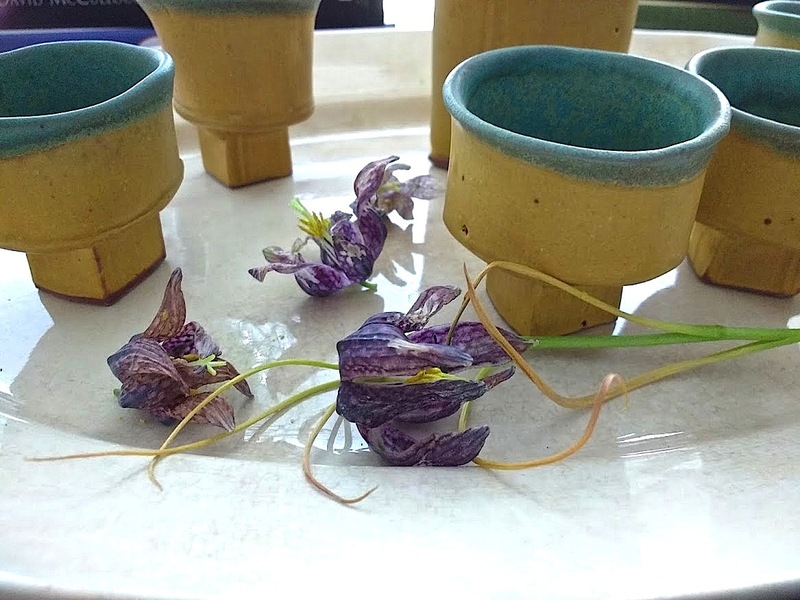 Then, to catch the excess water, I also put them down in blue pottery teacups from Rwanda’s Gatagara Cooperative. I covered the soil with seashell chips. The yellow-blue sake pitcher and cups in the photos above were made by American ceramics artist Hayne Bayless. They were purchased years ago at the Smithsonian Craft Show — which will be held this year from April 21 to 24 at the National Building Museum* in Washington, D.C. If you plan to be in the D.C. area that week, you can buy advance (discounted) tickets here. To see what other gardeners have put in a vase today, visit Cathy at Rambling in the Garden. *The Oehme/van Sweden exhibit will still be there. Hi, Thanks. 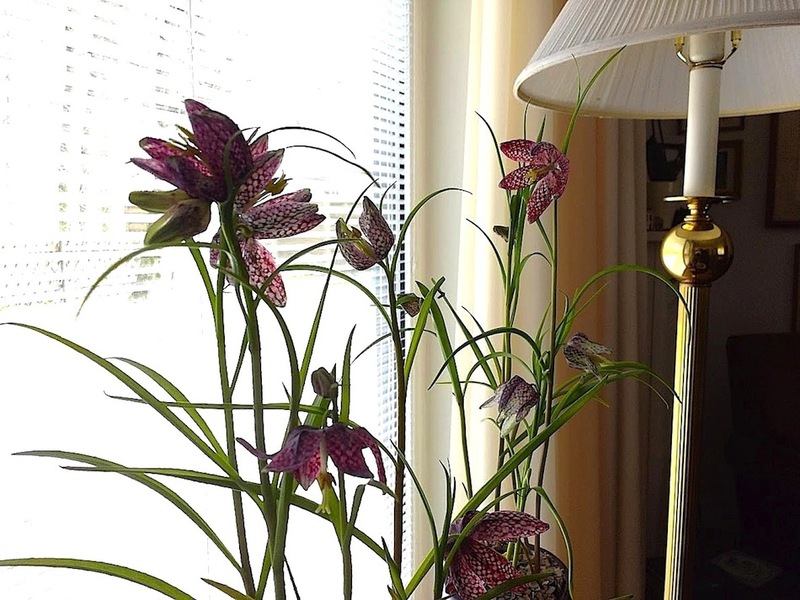 I’ve never seen potted Fritillaries for purchase in the U.S., but they are so nice to have since I love them but never get around to planting them in the ground in September. I just linked to Cathy’s blog. When I posted this morning (German time), she had not yet posted. Then I’ve been out running errands. 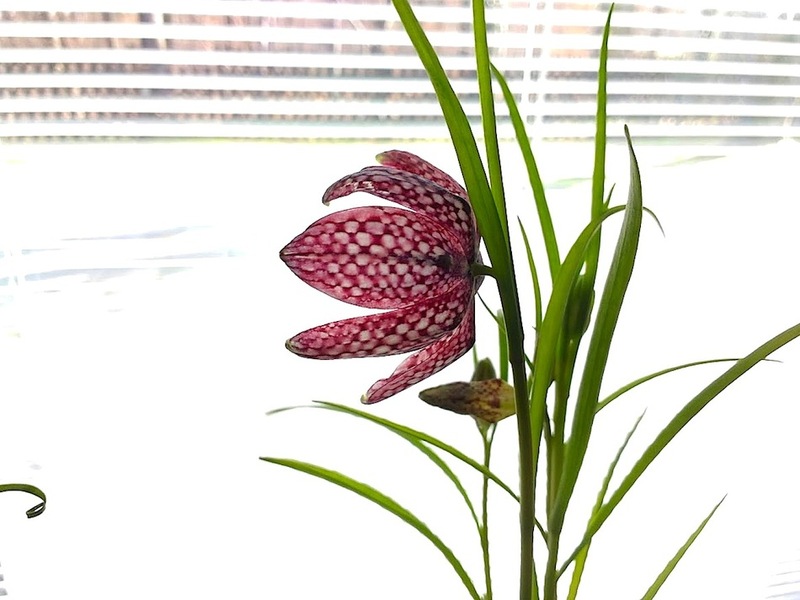 I absolutely love this checkered flower, but have never seen them growing indoors….what a treat! They are nice and will probably last until Wednesday — a week and a half. Oh! Wow Cindy I’ve never thought of forcing Fritillaries; they are so tall too. Can you explain how you did it please? Did the bulbs need chilling like my tulips? I wish I could take full credit, but I bought the bulbs in little plastic pots, already forced and almost ready to bloom. I just re-potted them. I was surprised how tall they are. Before I bought them, I had only seen them in pictures. Like many other commenters, I’ve never thought of forcing these indoors. But I will now; they’re beautiful! 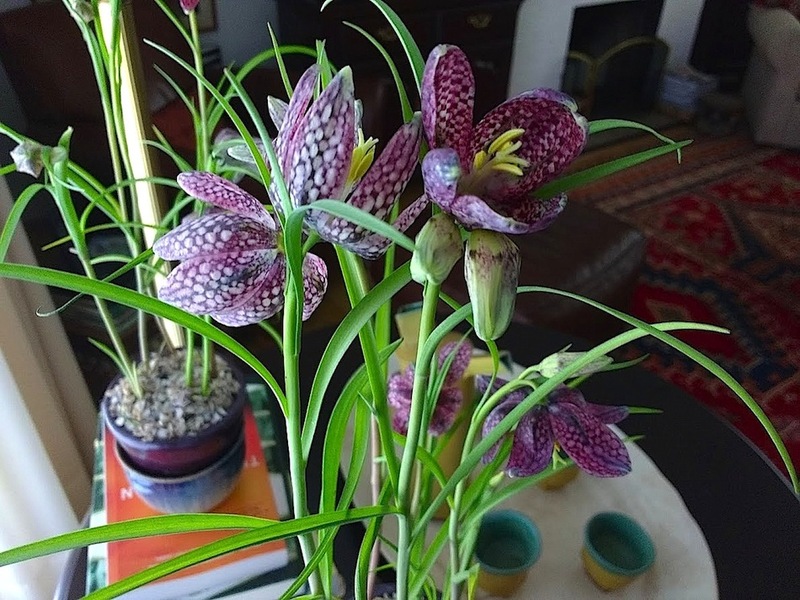 When you have some in the house, you can really examine the pattern on the blooms (without lying on the cold, damp ground).